Shortly before Elizabeth Warren announced her Senate candidacy, my husband asked her what past senators were her consumer protection role models and where on the spectrum between William Proxmire and Phil Hart she’d place herself. Proxmire was a maverick legislator, renowned for creating the Golden Fleece Award, sarcastically given to public officials who wasted taxpayer money, and for being unwilling to play what he deemed go-along-to-get-along political games. Hart was also a liberal but noted for his humility, civility and gentlenesss. He was esteemed by both sides of the aisle. Without hesitating, Warren said, her preferred model was Ohio Senator Howard Metzenbaum. 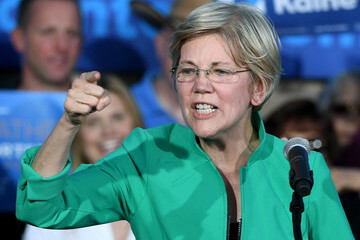 Elizabeth Warren assumed office prepared to leave “teeth and blood” on the floor fighting to protect those who’d been hammered against those who’d taken advantage of them. In four years in the Senate, she’s done that, providing a forceful voice for those victimized by a rigged system. She’s become both the heartthrob and pit bull of the Democratic Party, one who brought real passion to the battles to defeat Donald Trump. Her leadership is even more important now that there will be one-party control of the executive, legislative and (soon) judicial branches of government. But this week’s stories in the New York Times and the Boston Globe suggest a weakness that could seriously undermine her all-important role in the new Senate. Fortunately, although too slowly in my view, she acknowledged her error and called her victim to apologize. Warren had impetuously attacked hedge fund manager Whitney Tilson on Facebook for allegedly being a fan of Donald Trump and his appointments. Without reading Tilson’s full remarks or seeking the context for the quotation, Warren scoffed that “the next four years are going to be a bonanza for the Whitney Tilsons of the world.” The problem is that Tilson is a rare financier who supports Elizabeth Warren as well as the Dodd-Frank banking law. He also supported Hillary Clinton big time. When contacted by Tilson and his wife (a former student of Warren), the Senator was only willing to delete the erroneous descriptor of Tilson as a billionaire, but kept the negative posting until late yesterday. Some who have responded to her Facebook posting called Warren’s thoughtless misstep Trumpian. I wouldn’t go that far, (she did, after all, eventually apologize to her innocent victim), but, if we’ve learned anything this election cycle, it’s the dangers of knee-jerk ranting on social media without the benefit of all the facts. Warren has just been appointed to the Senate Armed Services Committee, an important position with relevance not just to the defense industry in Massachusetts but to questions of national security. Putting aside any aspirations to future higher office, not owning up to her mistake would have consequences for her efficacy in the here and now. Her attack on Tilson was sloppy and ill-informed, clearly painting with too broad a brush. Such shoot first/then aim approach undermines her credibility and communicates a reflexive way of thinking that is not helpful in this caustic political environment. It gives aid and comfort to her enemies who would trash her message by tarnishing the messenger. She must avoid becoming a caricature when her talents are sorely needed. The Democrats need to stand strong with well-grounded information in the face of fact- optional fusillades. Where possible, they also need to build bridges skillfully, reaching beyond purist ideological circles, not blowing up relationships in such a ham-handed way. This entry was posted in Uncategorized and tagged Elizabeth Warren attack, finance guy supports Dodd-Frank, Howard Metzenbaum, Phil Hart, Ted Stevens, Whitney Tilson, William Proxmire. Bookmark the permalink. Scroll all the way down the page, and click on the “Follow” at the bottom right.